Learn What Clear Aligners from Invisalign in Ocala are Made Of! It may be hard to believe at first, but clear aligners are quite capable of shifting teeth. Even when bombarded with saliva on a daily basis, they’re still able to shift teeth into an entirely new position safely and quicker than traditional orthodontics. In today’s post, your dentist will explore the material that’s used for Invisalign in Ocala, as well as the process that goes into realignment. With this knowledge in mind, you’ll have more assurance that your aligners can withstand regular use without worry! What are Clear Aligners Made of? While Invisalign’s aligners look similar to teeth-whitening trays, they are actually made of a thermoplastic, medical-grade material. To be exact, they are made from multilayer aromatic thermoplastic polyurethane/copolyester, making it strong but still moldable to fit patients’ unique smiles. Invisalign’s aligners have been classified as Class II medical devices by the FDA and has held their 510K clearance since 1998. The materials used are considered safe and biocompatible, meaning they can be used by humans without worry of the body rejecting them. Additionally, clear aligners do not contain Bisphenol-A, also known as BPA, nor do they contain other plasticizers like phthalate. How Do They Shift Teeth? Aligners work because each stage of the realignment process is planned from start to finish. 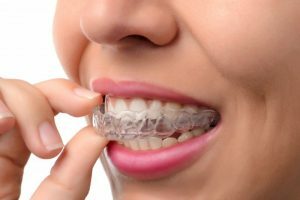 Once your cosmetic dentist in Ocala has determined that you’re eligible for Invisalign, he’ll begin planning each stage of your treatment with the help of digital photos and impressions. With these models, your dentist can map out what your teeth should look like after you’ve worn each pair of aligners for a set period of time, which is roughly two weeks per pair. Each pair applies targeted pressure to specific areas of your smile. In order for this force to work effectively, it’s crucial that patients wear the aligners as long as possible, only removing when necessary. On average, patients should be wearing them for at least 22 hours a day for the most optimal results. What Can Damage Clear Aligners? While Invisalign’s aligners are strong, they aren’t indestructible. That’s why your dentist recommends you remove them any time you’re eating food, drinking beverages other than water, and chewing gum. Failing to remove them when eating can cause them to crack, scratch, and stain. Not only will this make them less transparent and therefore more noticeable, but it will also make them more susceptible to collecting food and bacteria. This will only increase your risk of developing plaque and can even interfere with your realignment. For this reason, daily cleanings in either denture cleanser or Invisalign’s own brand of cleaning crystals is required for best results. Have more questions about the materials used for clear aligners? Ready to get started on your journey to a straighter smile? Schedule a consultation with your dentist today! Dr. Daniel Weldon earned his Doctor of Dental Medicine degree from the University of Florida College of Dentistry. He’s trained in many aspects of dentistry, including cosmetic dentistry, allowing him to help patients correct misaligned smiles and poor bites through the use of Invisalign. To learn more about his practice, contact him through his website. Comments Off on Learn What Clear Aligners from Invisalign in Ocala are Made Of!